I love pretty things especially when it comes to food. Someone did comment that it looks very 80’s but then who cares as long as it is pretty! Even I come from the 80’s anyway, maybe that is why I like it! It is an Italian recipe which I came across and is very simple to make although it might look very time consuming. But it does look great if you have guests over for dinner! I made this as a side dish which we served with a lovely fish baked in a salt crust. Chop the onion finely. Chop the smoked salmon and wash the prawns. Boil the black rice until tender. Saute the garlic in 2/3 tbsp of oil, adding the prawns and cook until they turn pink for 3 to 4 minutes over a moderate flame. Add half of the wine and leave to simmer for a couple minutes. Remove the prawns and set aside. Add the cornflour to the pan and add a little of the stock and stir until it slightly thickens, like a sauce. Saute half of the onion for 7 to 8 minutes in some olive oil, adding the chopped smoked salmon and after 1 to 2 minutes, add the white rice. Cook as you would a risotto, adding a bit of wine and then the stock little by little until cooked. Saute the remaining onion on low heat, adding the ginger and then the cooked black rice. Combine and then mix in the Parmesan Cheese. 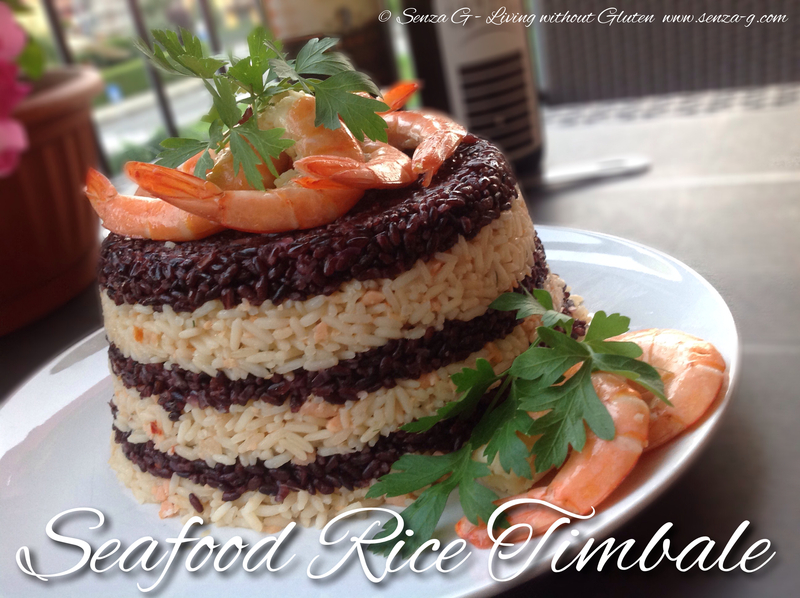 Grease a pudding basin and start layering the rice, starting with the black rice. Leave for at least 10 minutes before turning it out on a plate. Place the prawns decoratively on top and either drizzle with the sauce or else serve it separately. Garnish with parsley or dill sprigs.